This isn't an area that's been researched, which is understandable—it's not one of our worst symptoms by any stretch, and it also doesn't appear to be one of the more common ones. Because of the lack of research, we have to rely on trial and error and the experiences of others with this illness to learn about our hair-related problems. Hair loss is on the symptoms list for fibromyalgia. The good news is that it's temporary: our hair falls out, and then it grows back in. The bad news is that we have no proven treatments for preventing the fall-out. Many people with fibromyalgia report that they lose hair during times of high stress or during symptom flares. It's common to hear about someone washing their hair only to end up with their hands covered in it. Sometimes our significant others may notice an abnormal amount of hair in the bathtub or on a pillow, or will constantly pick it off of our backs and shoulders. A less common complaint than hair loss is scalp pain. You can find stories online from people who say that their scalp often feels like it's on fire and they can't even bear to wash or brush their hair. While a burning sensation that comes and goes certainly seems consistent with fibromyalgia pain, we don't have any evidence that specifically points to scalp pain as a fibromyalgia symptom. You should be sure to discuss odd symptoms like this with your doctor to see if something else could be going on. A study published in Pediatrics International mentions checking for pain by gently touching the hair as a possible part of a diagnostic workup for juvenile fibromyalgia. Sometimes, our hair itself may cause pain. One type of fibromyalgia pain is allodynia, which is basically pain from something that shouldn't be painful, such as a loose waistband or hair brushing against the skin. Especially heavy hair can cause pain as well, just from the weight. These problems make some people decide to cut their hair short or change the style. Other people report pain from having their hair pulled back in a ponytail or bun, while hair clips and headbands may be too painful for some of us to wear. Those wispy little re-growing hairs can detract from your hairstyle. 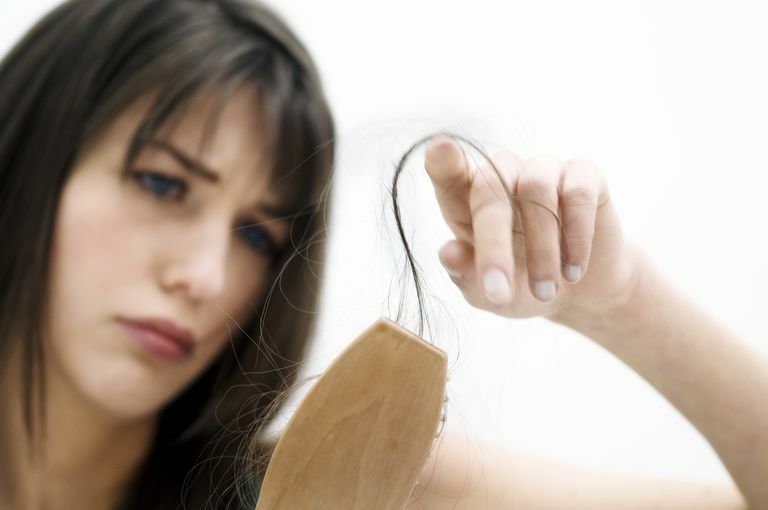 Loss can noticeably thin the hair, and some people even report bald patches. Many of us have changed or adapted our hairstyles as a result of these issues. Often, they're bad for self-esteem. For a lot of us, styling our hair at all is difficult. Holding the arms up to brush, braid, blow-dry, or flat iron can lead to arm pain that ranges from mildly annoying to seriously debilitating. It can also lead to significant muscle fatigue. In those with overlapping chronic fatigue syndrome, it may trigger post-exertional malaise. The heat from styling implements can also trigger bouts of extreme sweating, especially on the head or face. Some people may have to take multiple breaks while using these tools, so they don't just sweat away all their work. Others have given up using them entirely. When we have so many symptoms that can be disabling and force major changes upon us, it might seem silly or frivolous to talk about hair issues. However, the way we look can have a significant impact on self-esteem, which often takes a beating anyway when you lose abilities and independence to chronic illness. It can also be "one more thing" that illness takes away from us. Additionally, you might be able to use symptoms such as hair loss or arm fatigue to gauge how you're doing. For example, if you notice your hair loss increases just before a flare, then you may be able to anticipate or head off the increase in other symptoms, or at least make sure you're prepared for the flare. As with any symptom, if you notice a sudden or significant change in it, talk to your doctor. Something else may be going on.